The slimmer, lighter new model abandons the proprietary charging cable required by previous versions of the PlayStation Vita. Sony Worldwide Studios president Shuhei Yoshida announced the change to how the PlayStation Vita charges yesterday via Twitter. The tweet, translated by CVG, states, "You'll be happy to know PS Vita 2000 can charge with a smartphone charger with micro USB." Previous models required a unique charging cable produced by Sony. Many mobile devices, especially cell phones, use micro USB chargers. The redesigned PS Vita, officially known as model 2000, launched in Japan on October 10. Release dates for countries other than Japan have not yet been announced, but Sony has teased the possibility of a PlayStation 4 and PlayStation Vita bundle. 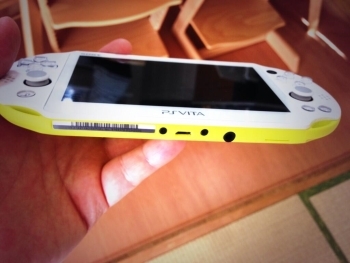 The latest PS Vita model comes in six different colors (black, white, yellow, grey, blue, and pink). The handheld is 15 percent thinner and 20 percent lighter than previous models, and includes 1 GB of internal memory where previously there was no onboard storage. An LED display replaces the previous OLED screen, a change that makes the handheld more affordable. Addressing concerns about the change in screen type, PlayStation Group chief executive Andrew House stated September 12, "The main reason is that the LCD panel can now realize an image quality as high as that of the OLED panel." The PS Vita 2000 is priced at 18,980 yen, or about $190. Previous versions of the Vita had their prices cut in August, dropping from $250 to $200 in the United States and with similar cuts globally. The switch to a micro USB charger does introduce a new question for the travelling gamer carrying just one charger: Do I charge my phone first, or my Vita?